Construction professionals must understand all aspects of a wide range of mechanical, electrical,and plumbing systems. 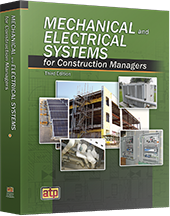 Mechanical and Electrical Systems for Construction Managers provides an overview of these systems and is designed for general contractors, construction managers,supervisors, and those desiring to enter the construction industry. This new, comprehensive edition includes sustainable construction methods and energy efficiencies along with building automation retrofits of existing systems. Each chapter includes review questions that test for comprehension of the content covered.